In a US Patent and Trademark Office patent assignment filing posted earlier this month, JGB Collateral (ODG's creditor that foreclosed on the patent assets and put them up for auction) lists Mentor Acquisitions One, LLC as the acquirer of the patent assets. You've probably never heard of that company, since the Delaware business entity formed just a few months ago, on January 16. 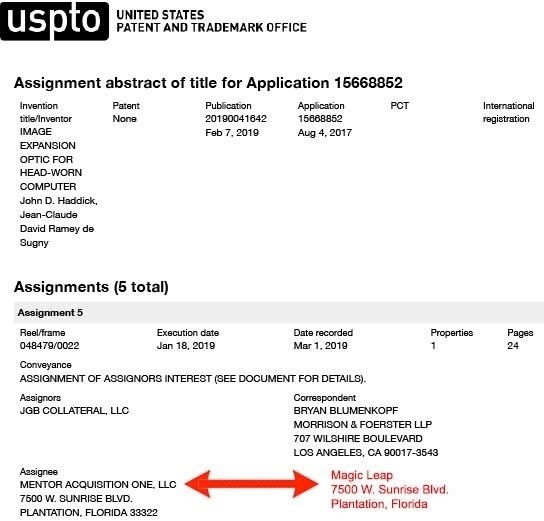 But upon further examination, we've discovered that Mentor Acquisitions One has the exact same address as Magic Leap, which is headquartered at 7500 W. Sunrise Blvd. in Plantation, Florida. Of course, if that address were a dense, high-rise populated part of New York City or San Francisco, it would be fair to consider that another AR-centric company might happen to share that address, perhaps operating on a different floor of a skyscraper. But that's not the case here since Magic Leap's headquarters are decidedly unique (for a tech startup) — located in a spread out area, largely devoid of high-rise buildings or tech startups. Just a few years ago, Magic Leap held a special event showing off the newly renovated space it had taken over, long before it ever showed anyone the Magic Leap One device. We've asked Magic Leap for confirmation or denial regarding any official connection to Mentor Acquisitions One and, as of this writing, the Magic Leap team hasn't delivered an official response to our request for comment. The leading patent in the batch is titled "Image expansion optic for head-worn computer" that the authors describe as "a head-worn see-through display includes a display panel adapted to generate image content light, a combiner adapted to reflect the image content light towards an eye of a user, wherein the combiner transmits scene light from a surrounding environment to the eye of the user, and an image expansion optic intermediate the display panel and the combiner." So while there's a chance that some other company called Mentor Acquisitions One is working on AR, and just happens be housed in the same building as Magic Leap in the unlikely neighborhood and building of 7500 W. Sunrise Blvd. in Plantation, Florida… that doesn't seem very likely. The good news is that it appears that ODG's patents didn't just get snapped up by some greedy patent collector looking to leverage the assets in the legal arena. Instead, it looks like ODG's auctioned off patents have found a home at a new company that will be able to carry on its AR legacy into the future.